There is growing demand that development interventions with a focus on assisting children on the streets are based on reliable evidence. At an international level, for example, the US Government's Action Plan on Children in Adversity seeks to help governments measure the population of children outside of family care in order to inform national advocacy, planning, implementation and evaluation. 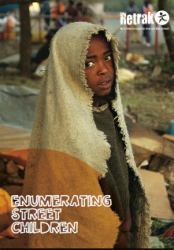 This technical note by Retrak outlines the importance of counting street children, describes challenges in enumeration, and provides methodological guidance in data collection and analysis.